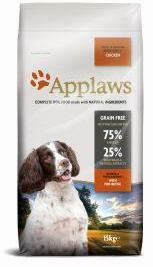 Applaws Natural Dry Dog Food A dogs digestive system is little different to that of a wolf. They have evolved to gain their protein from meat, not grains or cereals. Diets that use high levels of cereal as their source of protein can be hard dogs to digest and metabolise. This may cause stress to the liver and kidneys and could lead to the development of sensitivities or allergies. Cereals are also a major source of carbohydrate. The higher the cereal content the higher the level of carbohydrate. This could produce surges in blood sugar, which may lead to hyperactivity and could see dog becoming overweight. Applaws Dry Complete does not contain any unnecessary or cheaper additives such as cereal or grains to fill out the food. Applaws Dry Complete has been formulated to have a meat only protein level comparable to fresh whole chicken*. Applaws may help your dog maintain a healthy and active lifestyle. Low carbohydrate means less build up of body fat. High natural meat protein means lean muscle tissue encouraging your dog to reach its true genetic potential.